Insomnia can seem to be something of a dirty word in the sleep world, but here’s the thing: a staggering 50 percent of Britons are reported to suffer from the inability to fall asleep at night–that’s nearly 16 million of us. So when it comes to sleep deprivation, it’s time to shout about it, because if you’re one of the many who struggles to switch off at night, it’s certainly helpful to know that you’re not alone. In fact, according to the most recent scientific studies, most of us will experience sleep deprivation at some point in our lives, with the chances of sleepless nights increasing as you age. It’s enough to keep you awake at night with worry, isn’t it? Yet it needn’t be. If you experience sleep deprivation, you can rest assured that, alongside not being alone in your struggle, it’s likely temporary. Here we’ll look through some of the stress-busting solutions to help you rest easy once more. What is Sleep Deprivation or Insomnia? While the word ‘insomnia’ might be a whispered one, it’s certainly one we’re all familiar with. Yet a term that’s less thrown around is ‘sleep deprivation’, which is actually a type of insomnia. Sleep deprivation is caused by the inability to fall asleep or stay asleep soundly, while insomnia is the general sleep disorder of either not being able to fall asleep, or waking in the middle of the night and being unable to fall back asleep. Sleep deprivation is part of the family of insomnia, and the two diagnoses are often used interchangeably. While they both sound simple enough, you know that falling asleep can be anything but. While these symptoms aren’t exclusive to sleep disorders, insomnia is the umbrella term that’s applied when a serious lack of sleep affects your physical and mental wellbeing. Let’s face it–you know you don’t need a fancy word to describe the all-too-exhausting way it feels when you’re just not clocking the zzz’s you need. If you’re struggling to sleep, then knowing a little more about the kind of insomnia you might be experiencing can be a big help in looking to combat it. There are three levels of insomnia; transient, acute, and chronic, and as the names suggest, each of these types of insomnia vary in length and severity. Transient insomnia is the most common of sleep deprivation, and often the easiest to remedy. While transient insomnia is the least severe, usually lasting less than a week, it shouldn’t be overlooked, as even a small amount of sleep loss can affect your mood and wellbeing. Transient insomnia is often caused by other sleep disorders (such as sleep apnea, for example), an abrupt change in your sleeping environment, or stress, knowing what symptoms to look out for, and understanding what’s triggered your transient insomnia (such as a looming work deadline or a relationship worry) can be the key to help you find a healthy solution that will get your sleep back on track in no time at all. While acute insomnia shares similar traits to transient insomnia or short term sleep deprivation, the effects are more severe, and can last from several weeks to a month: definitely long enough to have anyone frantically searching for a solution. Acute insomnia can be caused by stress or depression, and the effects of this form of sleep deprivation can be more pronounced than with transient insomnia, meaning that you may experience some daytime symptoms, such as a decrease in energy, and an increase in irritability–hardly any wonder when you’re not getting the sleep you need to reboot and relax. While you aren’t in the chronic insomnia club yet, it is worth noting that this level of sleep deprivation is more serious and deserves help and attention to have you resting easy once more. Just as the name implies, chronic insomnia is the most severe of the three levels. If you’ve been clocking symptoms and have not been able to fall asleep, or stay asleep, for over a month, then it’s likely that you’re experiencing this level of insomnia, which is the rarest, and most intense form of sleep deprivation. The effects of chronic insomnia can include double vision during your waking hours, hallucinations, and mental fatigue, all of which can be stressful and worrying. Your chronic insomnia can either come about as the symptom of a different sleep disorder, or it can be the primary disorder. Either way, if you’re experiencing this level of insomnia, it’s important to seek help from a medical professional who can diagnose and work with you to fix the problem. While reading up on symptoms can be enough to have you tossing and turning at night (we all know, after all, that it’s never a good idea to Google symptoms in the small hours! ), it’s not all as bleak as it might feel, and help is most definitely at hand! It’s important to remember that you’re most definitely not alone--and once you identify your symptoms, and most importantly, how to treat this disorder, you’ll be on the right track to get your life (and sleep) back. While we’ve done a little work to uncover the various levels on insomnia in order to help you find the right solution, here we’re going to dig a little deeper and look at what makes an insomniac. While there is no one-size-fits-all diagnosis of what it means to suffer from sleep deprivation, there are a couple of commonalities that deserve investigating: namely the inability to fall asleep, and being unable to stay asleep. 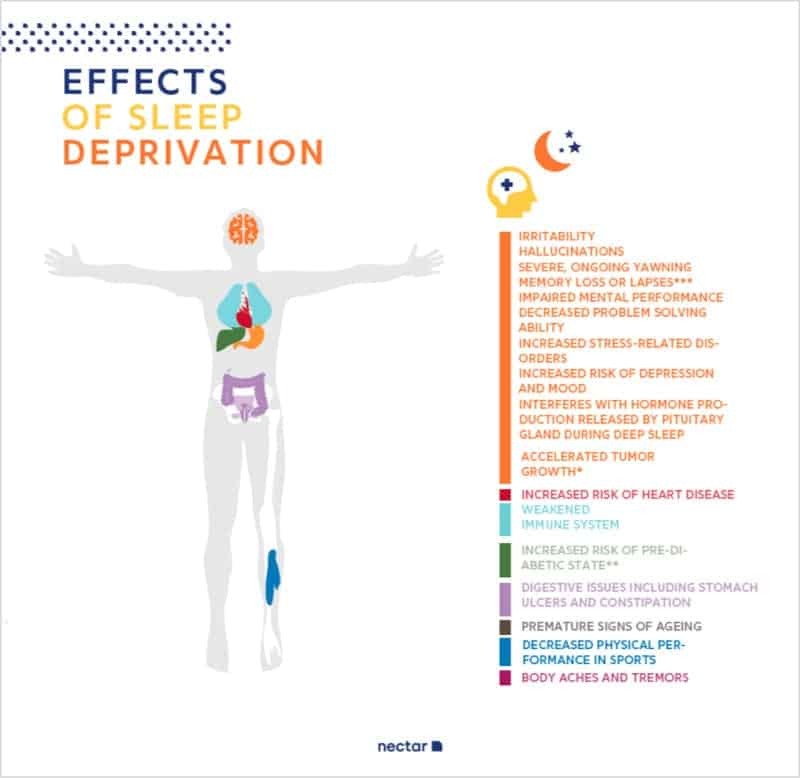 Are you at risk for or currently experiencing sleep deprivation? There are many ways in which insomnia can manifest. Most often, an insomniac will fail to be able to fall asleep directly, unable to find a “comfortable” spot in bed, for example. And in many cases, insomnia can take hold as an inability to fall back to sleep after waking up in the middle of the night. And if you’ve ever known that slowness of time that results from lying awake, staring at the ceiling, then you’ve probably found yourself watching TV, scrolling through your phone, or late-night snacking as a means to distract yourself from the fact that you just can’t sleep. It’s common for someone who is severely sleep deprived to find themselves, rather frustratingly, struggling to stay wake during the day, having woken up already unrested and on edge with such limited time spent in deep asleep. If this all sounds familiar, then it’s worth speaking with a sleep professional about a possible diagnosis. Of course, not all symptoms are straightforward, and some can feel rather like the chicken or the egg question when trying to figure out the cause and effect: Which one comes first? Anxiety and depression can be symptoms, but they can also be the trigger. More often than not, one feeds into the other. You can’t sleep, so you feel anxious, so you worry about sleeping, which prevents you from sleeping, which leads to more anxiety. It’s a vicious cycle that can seem endless, and impossible to break free from–but the good news is that you can. Do you wake up with a sore back or stiff muscles? If you find yourself pausing to consider these questions, then it’s worth considering that they might be a few of the reasons behind your sleep deprivation–but it’s not necessarily as simple as checking off a couple of problems: Insomnia is a tricky disorder, and its causes can be as varied as the people who experience them. We’ve already mentioned anxiety and depression, which are both, in themselves, hugely unique and large factors, entirely personal to the person and their situation. Changes in job or school can have an impact, as can money worries. Emotionally devastating changes, such the loss of a loved one or a relationship ending, can, too, play a part in causing sleep deprivation due to anxiety or depression–among many other causes. Your work schedule can play a large part in your sleep health, from long office hours, high pressure, and travel. If you fly often, for example, your body will feel the effect of a disrupted circadian rhythm. The circadian rhythm is how your body regulates its sleep-wake cycle. When you travel - especially overnight, and into different time zones - you can throw this rhythm off-course, which can lead to bouts of insomnia. While the temptation to have a late-night snack is something we’re all guilty of - and when long work days and busy schedules mean we often eat much later than we would like - having food too close to bedtime can also trigger insomnia. Sleep apnea from sudden weight gain makes late night eating a huge factor in many insomnia cases, and that late-night meal or nibble can cause indigestion, discomfort, and bloating: all physical attributes that can keep you awake. Not only that, but acid indigestion can lead to chronic breathing problems. None of those factors sound very appetising, especially when they play a part in many insomnia cases. You know what we’re talking about. Poor sleep habits may be the biggest factor when it comes to not getting enough zzz’s in the twenty-first century. While the digital age has brought about all manner of conveniences and innovations, we also can’t deny that it’s brought with it a myriad of problems, including providing us with yet another reason to not be able to switch off at night. Blue light, emitted from all digital devices with screens, is a proven enemy of sleep, sending signals to your brain to limit the creation of melatonin, the body’s natural sleep regulator. The result? You’ll stay glued to the screen, with your body convincing itself that it’s not time to sleep. While these symptoms and causes can feel overwhelming (especially when you’re tired!) it’s important to know that you are in control of your insomnia, and claiming back your sleep. In this next section, we’ll assess the possible remedies and cures that can work to treat your sleep disorders–no matter what form they take. The outlook is looking dreamy. Insomnia is a situation that leaves many of us feeling alone in the middle of the night, wondering why on earth our partner/friends/family can fall asleep at the drop of a hat when we can’t, which is why it’s at least reassuring to know that as a nation, we’re all in this together. If your sleep isn’t being affected, the chances are that you know someone whose is and so, in this section, we’ll delve into the possible treatments, cures, and remedies that might help to overcome an all-too common disorder for over half the British population. It sounds overly simple, doesn’t it? But trust us: anxiety is a huge enemy of sleep. If you find yourself checking your bedside clock, worried about the hour, and why you’re still not asleep then it could be time to try something else. It may seem counterintuitive, getting out of bed when all you want to do is sleep, but getting up to walk around the room can be the simple step you need to take the edge of that anxiety. Listen to music, or read a book (but try and avoid those blue-light electronic devices) until you start to feel drowsy, and then try getting back under the covers. You might be surprised at how quickly you see results from this simple method. A healthy balance of exercise and meditation can reduce cortisol, increase dopamine, manage weight gain, keep food cravings in check, and help reduce stress and anxiety, which are key troublemakers when it comes to sleep loss. In fact, studies have shown that those with a regular exercise schedule, combined with a consistent sleep pattern tend to not only sleep better in general, but experience less insomnia and sleep deprivation. But if the idea of a workout has you exhausted, don’t worry: a overly strenuous workout right before you hit bed isn’t actually recommended. Instead, save your cardio for a morning wake up, and try a combination of yoga, stretching, and meditation to help you ease body and mind into evening sleep. If you’re worried about antagonising existing aches and pains with a workout or stretch, then you might want to check that your mattress is still providing you with the support your body needs (and deserves). With a Nectar mattress you’re investing in comfort to relieve key pressure points, as well as comfort for your mind that you’re taking action to bid sleep deprivation goodbye. We’re all guilty of spending too much time on our mobile phones throughout the day, but we’re doing the biggest damage to our sleep by not switching off at night. With our phones constantly close by our side, we’re stimulating our minds with synthetic light when we’re meant to be dropping into a deep sleep cycle with no interruptions. Rather than getting into bed with our phone, scrolling through social media and responding to those annoying email notifications, plug your phone in away from reach and switch off from the day with a relaxing bath, some simple yoga stretches, or by curling up with a book, so you can sleep without the disruption of synthetic light and wake up feeling fully charged and ready to connect with a new day. When it comes to suffering from any form of sleep deprivation, it helps to first make sure that your bed is doing its best to bring you a deep, comfortable, and supportive sleep, every single night. After all, sleep health is important for our general health, and a foam mattress can be the single most effective tool for helping you get to sleep faster and rest longer, helping eliminate issues such as back pain, and sleeping hot, which can lead to sleep deprivation and insomnia. In a quality memory foam mattress, like Nectar, the hard-working layers of memory foam work together in harmony to help keep you cool, and well supported. A clever Adaptive cooling cover will work throughout the night to keep you at your optimum temperature for sound sleep, while a 7 Zone Supported Base Layer takes care of to meet each of your pressure points with the perfect level of support. It’s no wonder that memory foam was developed by NASA: it may not be rocket science, but we’ve worked hard with premium materials that are engineered for a mattress that’s light years ahead of the rest. Our bedrooms are often our sanctuaries, our own private space for rest, relaxation, and intimacy. And while aesthetics are important, it take more than just looks to make your sleep set-up work for you. Your bedroom can have a big impact on your rest, and with a few minor adjustments, you can combat some of the issues that might trigger a sleepless night and lead to bouts of insomnia. In the bedroom, good sleep hygiene, as sleep experts call it, is about assessing the way you utilise your sleep space. Since your sleep is crucial to your health, try setting some boundaries that bring your well-being back into focus. That means no computers, tablets, or mobile phones. That’s right: no electronics (that annoying electronic hum is hardly a soothing lullaby, is it?). Often the light emitted from such devices can cause your brain to wake up in ways that promote insomnia, so banning them from the bedroom can go a long way in getting you back to a healthy sleeping routine. And it’s not just electronic light that can affect your sleep. If you’re woken too early, or are kept awake by streetlights, it could be worth investing in blackout blinds or curtains to keep insomnia blocked out of your bedroom. While there are plenty of over-the-counter options, not all of us are keen to rely upon modern medicine to help us sleep, preferring to make the most of some of nature’s offerings. If you’re struggling to sleep, there are number of natural remedies that can help soothe your mind and prepare your body for bed. Setting the mood in your bedroom with low lighting is a great way to signal it’s time for sleep, while a soothing cup of caffeine-free tea can be the perfect antidote to a stressful day and leave you relaxed and ready for a good night’s sleep. Here are a few of our go-to options for natural sleep aids. Camomile is a herb known for its stress-busting and natural sedative qualities. The daisy-like flower has been used for centuries to promote relaxation and calm, and with its light, sweet flavour, especially when mixed with warm milk, it’s a great, comforting drink to sip before sleep. Introducing a calming nightly ritual with lavender scented candles, incense, or even an eye mask can be a wonderfully natural way to bring some serenity to your sleep space and mind and soothe your senses without having to eat or drink anything. Valerian root is another natural herbal remedy that is known to ease anxiety and help with regulating your circadian rhythm, which is your body’s way of restoring your sleep-wake cycle. While stronger medication can also work, we recommend talking to your GP before trying anything out. And with so many remedies to try, there’s bound to be a natural solution that works for you, so you can enjoy a healthy sleep schedule once more. Remember, your insomnia doesn’t define you, and taking steps to assess and understand your sleep can often the first empowering remedy that has you back in the driving seat of your health and happiness. We know that, with a little relaxation, some patience, and some natural know-how, you’ll soon be reunited with a sleep schedule that works for you. According to research, if you experience sleep deprivation one night but can get a full 10 hours of sleep the following night, you will likely feel nearly, but not 100%, normal the next day: a second night of recovery sleep or an afternoon nap will have you feeling fully restored and rested once more. However, getting the advised eight hours, or even 10 recovery hours of sleep after a prolonged sleep deprivation period of a week or more is not enough to fully normalise you. Continuous sleep deprivation can leave you feeling exhausted even after a good night of recovery sleep. For long-term sleep deprivation, it can take days, or weeks, to feel fully rested again. How many hours of sleep do you need to be sleep deprived? It doesn’t take very long at all to start feeling the effects of sleep deprivation–in fact, it can take just one night of less than 7 hours of sleep. While that might not seem so severe, a lack of regular hours can add up quickly and lead to more serious cause for concern alongside your tiredness. After just seven nights of too little sleep, up to 700 genetic changes can occur in the body– changes that could play a role in health complications such as heart problems and obesity. In 1964, Randy Gardner, a student in San Diego, California, became the World Record Holder for the longest time awake, going without sleep for 11 days and 25 minutes. While no human being is known to have died from staying awake, there’s a likely reason why no one has beaten that record since: it’s just not healthy to go without sleep for such a long period of time, with health complications such as heart problems, depression, diabetes and weight gain all the outcome of sleep deprivation. With animal research strongly suggesting the plausibility, it’s possible that, given enough time, sleep deprivation can kill you. What happens after 48 hours of no sleep? Beyond feeling very, very tired, the effects of no sleep for more than 48 hours are extreme enough for your body and mind to operate in a way that can put your health, and your life, at risk. You might experience cognitive impairment, hallucinations, memory loss, paranoia, or mood swings. Even after just 24 hours of no sleep, your performance impairment is similar to that of someone with a blood alcohol level of 0.10 percent, which is why it can be so dangerous to drive when you’re tired, with your reaction and decision-making skills impaired. If your bedroom is as sound and light proof as possible, and you’re laid back on a comfortable mattress, a simple breathing exercise like this might just be the final nudge you need to help you nod off in five minutes flat. Can you sleep with anxiety? While it is more difficult to fall asleep and get into a deep, restful sleep cycle if you are suffering from anxiety, it is still possible. If you find yourself experiencing anxious thoughts or feelings, try to focus on positive images, phrases, or memories to help you calm down before bed. Put yourself back in charge of your sleep by sipping a camomile, lavender or herbal tea that helps you relax, play some soothing music, such as jazz or classical, and practice a mindfulness meditation or breathing exercise to help stop your mind from racing as you prepare your body for a good night’s anxiety-free rest.